So the silk clothes come first in our list and this is because they are really very delicate and subtle and they require extreme attention and consideration when cleaning, keeping, and using them. There is always the danger of getting stains on them even because of perspiration. So here are the things that you should take into account in order to take care of your silk pieces. 1. The very first thing you need to remember is the way your silk clothing needs to be washed. Thus, it is fine to use dry-cleaning for silk clothing taking into account the fact that silk clothing is prone to lose shape and color too easily and quickly, but if you want to preserve the shape and the overall good looks of your garments, then you should hand wash them. 2. The right temperature of water that you should use in this case is cool or better lukewarm not forgetting about some mild detergents or if you can’t add anything of that type at the moment just dissolve some shampoo in water. 3. One more thing that you should remember is that silk fabrics should not be exposed to the change of temperature of the water while washing. So if you started with one temperature, then don’t change it for anything else somewhere in the middle. 4. While for other garments it’s normal to squeeze the water out, you shouldn’t use that technique for silk pieces. Instead you should just roll all of your silk garments in a towel and gently press the water out of them. 5. It’s only the pieces with a label “washable silk’ that can be washed in a washing machine. Still you need to remember to adjust a regime for gentle cycling and to use a mesh bag. After washing you need to hang the pieces dry on a special padded hanger. 6. If you want to preserve the fine condition of silk, it’s a good idea to add up to three tablespoons of white vinegar for every two quarts of water. 7. Ironing is another really important aspect of caring for silk and you need to make sure that the setting is low and the steam is turned off, since both in case of high setting and steam you risk getting irreversible stains on your fave pieces of clothing. Also you should remember to iron the pieces, while still damp. 8. As for storing silk, you should consider dry and dark places, where there is no penetration of sun. Also be sure not to use plastic for storing it, because silk is a natural fabric and it needs to breathe. 9. Washing is again the first thing that you should know and take into account when taking care of jeans, because sometimes you need to wait for some six months for the raw jeans to break in. This is because jeans tend to change their shape according to your silhouette, and when you wash them, the shape can be lost. However, if the jeans are treated (sometimes they are intentionally washed to acquire a faded look especially for the ripped types), you can wash them more often. 10. Before washing your jeans, make sure to zip it up and fasten the buttons. 11. Before taking a shower it’s really a good idea to hang your jeans in the bathroom in order to let the steam keep the condition and the look fresh. The same can be achieved with the help of keeping the jeans frozen in plastic bags for a couple of days. This is also a great idea for getting rid of the smell that you sometimes feel when wearing the jeans. 12. One more tip you need to know about washing jeans is that it’s really recommended washing them inside out and in cold water putting the setting on delicate cycle or doing the same by hand. However, you can wash them with warm water in case you do want your jeans to fade quickly. 13. As in case of silk clothes, here too you may also add half a cup of distilled white vinegar to the final rinse in order to keep the color and the good looks of the jeans pieces. 14. One more thing we would suggest you doing is using hand washing instead of using the washing machine. This is really a better alternative for keeping the garments clean and fresh and avoiding early fading. However, if you do need to wash them with the washing machine adjust the setting on the lowest heat setting possible. 15. Folding and storing the jeans is just as important to keep their good condition. Thus what you should do is fold the jeans from left to right and repeat the fold this time matching the hem with the waistband. Then repeat the fold in the same direction and there you will get the perfect fold for denim. 16. 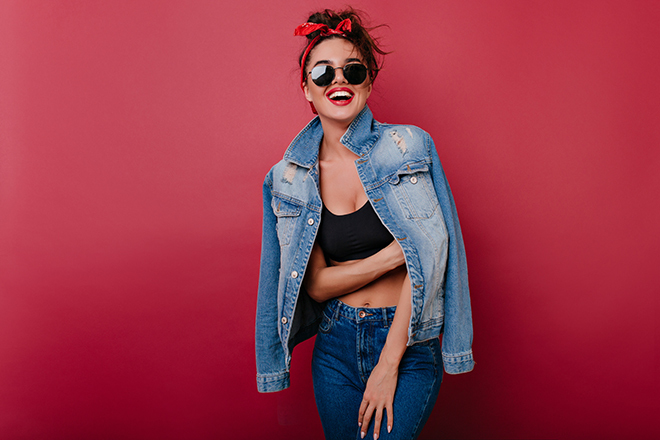 Just like in case of silk, denim fibers also need to breathe, that’s why you need to avoid keeping jeans in crowded places or hanging them somewhere with a lot of clothes. 17. If you have bought new jeans and you feel uncomfortable for some parts and you need to take them to the tailor, you need to do that after some two washes, because jeans might shrink after washing and after a couple of washes you will see the real size and be able to make the correct modifications. 18. Another curious technique you may use with denim is about the correct size. It’s about finding the right size if you don’t have time to try them on in the fitting room. So what you may do is practice the neck method according to which you need to put the waistband of the jeans around the diameter of your neck and see whether it suits loose or comfortably. 19. In addition, if your jeans feel too tight, you may just go for air-drying and then manually tug them to stretch in width. If you want some extra stretching then you may also use the effect of hairdryer or use a steam-filled really hot iron making sure that the jeans are still damp. 20. The very first thing that you need to remember is that cashmere pieces are recommended to wash by hand no matter what the tag may say. The most suitable products that should be used for washing cashmere pieces is baby shampoo or some other soft cleaners, which will clean the clothes not letting the fabric loosen and not affecting the overall looks of the clothes. Washing these clothes with delicate movements is also very important. Only this way will you be able to preserve these clothes soft and beautiful. 21. One more thing that you need to remember is that you shouldn’t hold up your still wet cashmere sweaters by the shoulders because this will stretch it out even more. Keeping it in a lump will be the thing you need especially for preserving the good shape. This is recommended and important because cashmere pieces have a tendency to reshape and stretch especially quickly when being wet, since keeping water inside they get heavier and that pulls them down when you hold them up by the shoulders. 22. Using things like salad spinner is a really good idea for making cashmere sweaters dry quicker. If you don’t have one, there’s no problem since you can always use the tested and effective method of laying it on a flat surface and pressing the water out of it using a towel. In this way you will be able to preserve the shape and make it dry quickly due to the removal of water. 23. As for folding cashmere pieces, you should use the thirds method of folding, with the help of which you will avoid having fold lines on any parts of the sweaters especially well noticeable in the front parts. What makes this important is that if you have those lines, it will be really difficult to get rid of them further. 24. In addition, cashmere requires some attention for being stored for winter, too. If you don’t manage to store it properly, you’ll risk not recognizing your favorite sweaters when winter arrives. Thus what you should do is cleaning and gently folding your sweaters with the help of which you will get rid of the various scents like those of perfume, food, deodorant, smoke, etc. In addition, if you don’t fold these pieces properly you will not like their looks later. 25. One more thing we would like to note is the way you should use for dry-cleaning your cashmere pieces. So the very first thing you should do is removing the garments from the protective plastic right away, then wrapping them in a tissue paper and placing in cedar-scented bags, which will work way better. However, we would strongly recommend you to practice hand washing instead, which is safer and more effective. Dry-cleaning is only recommended in case you have some specific stains to remove. 26. When using a deodorant, you should wait until it dries before you put on the sweater. This way you will avoid getting stains and the scent of the deodorant on the sweater, and this is in fact important because further you will have really hard times removing all these from your sweater. The same goes true of perfume, too. 27. You should keep your cashmere sweaters away from any purses, jewelry, and other pieces that might pill, snag, or make holes in the texture. Such damages are really hard if not impossible to recover, so you’d better avoid such things when wearing cashmere sweaters. 28. The temperature of water is just as important and what you should prefer is cold water, which will not damage the fibers and will work well for keeping the looks fresh, without having to bring back the natural colors and shapes after washing. 29. Just like in case of silk pieces, you shouldn’t change the temperature of water suddenly while washing your cashmere pieces, because this might cause shape and color damage, too. So if you have started with cold water, rinse the soap off with cold water, too. 30. Finally, you should also keep your sweaters as far from heat sources and windows as possible when storing them. When being subjected to heat or wind, they really have great chances of losing their shapes and becoming unusable. 31. When you want to remove a sudden stain from your sweater, and if you don’t want to send it for dry-cleaning, you may apply a little bit of stain remover to the stain, wait until it penetrates and then rinse it off with cold water without any rubbing or other procedures like that in order not to lose the elasticity and shape of that part. 32. The importance of breathing is also worth paying attention to in this case. So be sure not to store your cashmere pieces in plastic bags in order to have fresh pieces when winter months arrive! 33. When it comes to removing the pilling, the most suitable thing you may use is sweater shaver. Still you need to be delicate and gentle, because if you press a little hard you risk damaging the texture. So clean gently and delicately. 34. As for ironing, you need to iron your cashmere sweaters inside out on low heat, of course, or just use steaming which is a more preferable option, because you exclude the impact of direct heating with the help of which you have fresher and more beautiful looks for your pieces. The following range of tips we would like to suggest goes for cotton pieces, which are no less attention-requiring and delicate, especially when it comes to pieces like shirts and tops. So here is the list of dos for caring for cotton pieces. 35. In comparison with other fabrics, cotton is more durable, so the preference for hand washing we spoke about for the previous fabrics is not to be repeated here. You can use the washing machine with any detergent, and also remove the stains via bleaching if the color of the pieces is suitable, of course. So despite the fact that there are some things you should know about for caring for cotton pieces, washing techniques are more permissive in this case. Still, if you see something like ‘cold water only’ on a cotton piece tag, most likely this means that the piece is inclined to shrink after the very first wash, if not washed properly. So be careful to follow the instructions provided in this case. 36. However, there are some washing preferences for cotton pieces especially in terms of water temperature and cycle regime. So the former should be just warm and not too hot, and the latter should be normal, being neither too delicate nor too harsh. So the golden average is the necessary thing in both cases. 37. Low setting is what’s required for the proper drying of cotton pieces. Too high setting might cause the appearance of irreversible stains especially on white pieces. For colored pieces you may also use color-safe bleach, which will remove the stain not touching the color. 38. Despite the fact that we recommend warm water for cotton pieces in general, you can still use hot water for bleaching in case you need to remove some particular stains. Still, you shouldn’t go too far with rubbing and washing especially for the problematic areas. And, of course, this goes for white pieces only. 39. One frequent problem with cotton pieces is that they lose softness and elasticity very quickly and in order to avoid that you may use half the amount of detergent and also follow up with an additional rinse cycle thus not letting the detergent make your pieces less soft and fluffy. This is especially true and useful for pieces like towels and washcloths. 40. Picking cotton pieces correctly is the following thing that you should know how to do. Thus one thing you need to remember is that cotton pieces hold paint with more difficulty like any natural fabric compared with faux fabrics. So when picking cotton pieces you should give your preference to lighter tones, which are less likely to lose their looks quickly compared with darker shades. At least you won’t have any changes after the very first wash. When ironing these pieces you may use the iron directly over the texture or use a special wet layer of fabric over it. 41. As for wrinkles, you may iron them on the highest heat level. This fabric is made from wood cellulose, that’s why it’s considered to be natural. Viscose pieces are soft and comfy. They breathe just like silk and cotton and they let the air penetrate through. That’s why they become an irreplaceable option for summer. However, this fabric also has its weak points and this time the latter can also be taken in the proper sense because these pieces quickly get damaged and torn, especially when still wet and of course this is most probable to happen during washing. Thus, here are the main things that you need to take into account when treating viscose pieces! 42. When you pick viscose pieces you should focus on options having soft and smooth silky texture with shine like poplin. These details mean that the piece is stronger and will preserve the good looks longer than those, which do not have these specifications. 43. So as we noted, viscose is very lightweight and soft, and it’s really easy to drape and keep it. Still one thing that is not that pleasant about viscose is the fact that it wrinkles very easily. So what you need to do is use iron’s medium setting necessarily accompanying it with steam in order to get rid of the wrinkles and also keep the proper looks of the garments. 44. Coming to washing, we would recommend washing viscose pieces with lukewarm water, which should be preserved up to the end of washing. You can use the washing machine, but we would insist on hand washing in order to be able to control the whole process and not to damage the fibers with possible harsh moves or influence. 45. When finished after rinsing viscose clothing with warm water again, you just need to hang the pieces totally wet without any wringing or twisting with the help of which you will make sure that the pieces won’t lose their natural shapes, which is really very possible in case of viscose pieces. 46. You may also lay the pieces on a flat surface and dry them that way again contributing to the process of drying and avoiding shape loss effectively. You can also use some pressing in order to remove the water from the fibers and let the pieces dry easily. 47. However, if you notice a label with special instructions on it, do pay attention to them and follow them since that might mean that the piece has some special and unique characteristics, which are different from what you know about viscose pieces. Leather pieces are present with different proportions in the wardrobe of every lady and they also do require special attention and care. Unfortunately not everyone knows how to care for leather pieces properly in order to enjoy their good looks and effective combos created with them as long as possible. Thus here is the list of the top dos that you should take into account when dealing with leather pieces! 48. First of all, before wearing a leather jacket, for instance, you should treat it with scotch guard or a similar spray in order to avoid the penetration of water, the appearance of stains or grime. All of these are the problems that leather pieces most frequently happen to present so just pre-treat them before wearing to prevent all that. 49. One more thing that you should so with leather pieces before wearing them is getting rid of the specific smell they usually have. So in order to do that you should sprinkle some grounded coffee over the leather pieces and let those pieces stay like that for a couple of days. This method is suitable and effective for any leather type, except for white and pastel colored leather, which might get stains because of coffee requiring further treatment and procedures. 50. One of the most effective ways of cleaning a leather piece is simply using a damp cloth. Since leather is not the type of material, which holds dirt or stains easily, especially the darker tones, you can simply wipe off the dirt and dust with the help of a simple damp cloth. 51. Since leather is noted for stretching out easily, you should be attentive when keeping it too, so be sure to hang it on a well-shaped hanger every time you take it off in order to preserve the natural and good looks and the proper shape for as long as possible. This is also true about keeping the leather pieces for colder months. 52. The biggest possibility of getting stains on leather pieces is when wearing them out in rainy weather, since watermarks are the very first and most difficult problem about leather pieces. In addition, you should also keep them hung in a well-ventilated and dry closet in order to avoid the further appearance of such stains later. 53. One more thing that can leave stains on your leather pieces is salt so you should remove those stains as soon as possible, since the more they stay the worse the condition will become. Using a professional leather cleaner once a year is another thing you should do in order to have your leather pieces stored and kept properly. 54. What you shouldn’t ever do is using a hair dryer to dry wet leather pieces since it only makes the condition of leather worse, contributing to the loss of shape and proper texture shine. 55. One more thing that we would not suggest doing is keeping leather pieces in polyethylene, be that a bag or a film. The thing is that like any other natural material, leather also needs to breathe, which is in fact impossible in case of such packets. Instead, you may keep you leather pieces in linen or other fabrics like that to give the material a chance to breathe and preserve the proper looks. 56. In order to bring back the good looks of a leather piece and to refresh it you may use some soap and ammonia. After rubbing these materials all over the texture you should run them with a soft cloth moistened in castor oil, glycerin, or Vaseline. This is a unique and really effective formula for refreshing the leather pieces and gifting them with a second breath. 57. When you need to clean your leather pieces, which are too thin and soft, you may use the following method. First of all you should make a mixture of equal proportions of milk and turpentine, after which you should rub the mixture all over the texture and follow up with a transparent cream and polish the texture off with a soft brush. This will get the job of cleaning those delicate leather textures really well. 58. As for keeping leather pieces including such options as belts, one thing that we should note is that you should not store them folded or draped. 59. In addition, if you would like to add some shine to the texture of leather you may rub it with a soft handkerchief or a cloth moistened in egg white beforehand. This will work really well for gifting the texture of your coats, jackets, gloves, handbags, boots or even pieces of furniture like sofa with the irreplaceable and great shine and shimmer. 60. You can wash your leather gloves in warm soapy water. During the final rinse, add a few drops of glycerin to the water. The very first thing that polyester is noted with is the strength and the ability to resist creases and preserve its shape. Especially when it gets mixed with cotton, this man-made wonderful fabric manages to demonstrate the best results possible. The combination of polyester and viscose is just as effective and easily manageable. The hydrophobic nature resulting in quick drying functions is another thing that makes this fabric so special. Thus here are the tips we’ve prepared for polyester this time! 61. Most of the types of polyester have no limitations in terms of machine washing and drying due to the capabilities of shape preservation and strong texture. However, you do need to check the labels and tags for extra instructions, which might sometimes tell you to use dry-cleaning only for some options and blends with other fabrics. 62. As for drying, you need a low temperature for it, and a moderately warm iron if you need that, too. However strong and steady may the fabric be, still you should not expose it to too high temperatures neither for washing nor for drying. 63. Still, one thing that you might not like about this fabric is that it holds stains really steadily and you need to try hard in order to get rid of some of them sometimes. So one thing you may try out is rubbing a stain remover over the area you need and after letting it stay on for 10-20 minutes, just wash it off. 64. One more method for removing stains that we would suggest is soaking the fabric in a gallon of water with 1/3 of automatic dishwashing soap some 24 hours before washing, this way preparing the area for the complete removal of the stain. This is the best way to use for white pieces. 65. In addition, you should also use an anti-static product with the help of which you will prevent the garments’ sticking to your skin effectively. Wool pieces are the following noteworthy options we would like to speak about. Wool belongs to the category of natural fabrics again, and this does influence the overall way according to which it should be treated. So here are the basic details you need to take into account! 66. One thing you need to bear in mind about wool pieces is that they should be given a day of rest after each day of wear in order to preserve the shapes and looks. You may also treat them with a lint or suede brush after each time of wearing them in order to remove the surface soil and lint. 67. These pieces should be hung on wood hangers in order to avoid stretching the area of shoulders, which is most likely to happen in case of being hung incorrectly. So the form of the hangers and the condition of the wardrobe (which should be dry) are really important for keeping wool pieces. 68. Breathing is again quite important for wool pieces, too, and they should be stored in wardrobes with enough capacity in order to have all the necessary conditions for keeping wool pieces fresh and nice. Otherwise they will lose their elasticity and good looks quite soon and quickly. 69. As for stain removal, this procedure should be practiced with the help of blotting the stained areas with cold water or some club soda applying them with the help of absorbent cloths or some paper towels. What you should not do in any case is rubbing the stained areas, as a result of which you may deform the areas you’re treating and lose the shape of the piece. 70. As for the cleaning time, we would recommend cleaning your wool pieces at the beginning and at the end of the colder season, with the help of which you will remove the accumulated perfume, smoke, and dust out of the pieces and will be able to keep them safe and soft for the season, which has come or is still to come. 71. When you take off your wool coats and pants, be sure to empty the pockets in order not to have sagging or shape deformation because of the heavy things you might be putting in your pockets during the day. 72. Cool water is what you need for the proper washing of wool pieces. You can use hand washing or machine washing, but in both cases the suitable wool cycle with cool water and overall mild procedure is required. 73. As for hand washing, which is more recommended for the preservation of the proper shapes and colors, we would suggest using a mild detergent and lukewarm water again, being sure to let the pieces soak for some 3-5 minutes before you pass to actually washing them in cool water. Squeezing can be used for drying these garments, but you really need to be gentle while doing that, after which you just need to lay it flat. 74. Bleaching or using hot water are two impermissible things that you should absolutely exclude from your daily activities. The reason is that both are disastrous for this fabric and looks of the wool pieces, completely reshaping them and changing the natural colors. As for cold water, it can perform the contrary effect, making the pieces suddenly shrink. So keep the golden average here, too. 75. If you want to quickly refresh the looks of your wool pieces, you just need to place them in a steamy bathroom for some time, after which the nice and brand-new looks will be right back with the proper and good feel they had in the beginning. 76. If you need to dry your wool pieces quickly, then you may use a nap with the help of which you may brush the piece or just let it dry at room temperature away from heat. It is also not recommended using blow dry methods or anything of that type with exposure to excess heat. 77. Using steam when ironing is the following thing that you need to pay attention to. One more thing you should know is that you should not iron wool pieces when completely dry. Ironing the reverse side is also a good idea also using a cloth, which will prevent the fabric from acquiring a shine. Do not slide the iron back and forth, but lift it and then lower it back instead. Velvet is the following fabric we would like to tell you a few things about, especially concentrating on the fact that this is one of the most delicate and soft textures that you may ever have. So caring for velvet pieces is also important because velvet clothes are prone to lose their texture sections and their overall fluffy and shiny looks quite easily because of not caring for them properly. So the list goes as follows! 78. The very first thing that we would like to speak about when discussing velvet pieces is that you should look at the label and the tag before doing anything with your velvet clothes. If the label says that the piece should be dry-cleaned, it means that’s a special type of velvet. If not, however, that most probably means that the pieces are a type like the crushed velvet, which should or can also be washed using the washing machine. 79. Ironing is totally prohibited in case of velvet pieces, since iron will damage the delicate fibers and will leave stains on the clothing, which will not be possible to be removed further and you will practically lose one of your fave pieces. So in order avoid this, do not expose your velvet pieces to excess heat treatments. 80. If you need to remove the wrinkles on your velvet pieces, steaming is the most suitable option for you. You just need to steam the pieces and quickly get rid of the small wrinkles not forgetting to turn the pieces inside out before steaming. 81. If that’s about getting rid of big creases, you may also hang up your pieces in a steamy bathroom. 82. As for storing your velvet clothes, you should remember not to store them folded because this will create creases and folds, which will be too hard to remove. So instead of folding, you should just tuff the items with tissue paper and lay it in a flat position on special boxes for clothes. 83. There is absolutely no need to iron or press or blot velvet pieces so if you spilled something, you need to shake out the moisture immediately and if the stain remains, just read the instructions given on the label. Fur pieces are the next actual and attention gathering group of garments that you should pay attention to, when trying to care for the pieces you have in general. So now let’s have a nosey at the tips and basic know-hows, which you should also know for effective care for fur pieces, too. So here’s the list! 84. You may use products like semolina or potato starch to refresh the colors and the shapes of the worn fur pieces here, too. 85. For the fur clothes in darker shades you may use the mixture of equal proportions of vinegar, alcohol, and water and apply it to the coat with a brush. 86. If there are some oil stains on the fur options of pieces, you may get rid of them with the help of the mixture of ammonia, dropping a tsp. of it into half liters of water and three tsp. of salt. 87. If your fur coat became damp because you got under a heavy rain or snow in it or just some water appeared on your coat, you should try to avoid using any kind of tools that are aimed at drying your fur garments quickly. After they get dry naturally just brush through first in the direction of the hair and then in the opposite direction eventually just softening the texture by the hand when moving in the direction of the hair. 88. One more thing that you should know about fur pieces is that before each summer you should store them in special cases, which need to be processed with special products and materials, also possibly having things like orange peels or tobacco leaves inside to prevent spoiling. 89. Try to keep the fur pieces in as dark and as cool places as possible absolutely excluding the penetration of sunlight. 90. In addition, you should also try to pick as wide hangers for your fur coats as possible, in order to preserve the good shapes and the nice looks of your pieces. 91. Another don’t that you should know is that you should never wash fur pieces with powder, putting them under the shower and drying them with hair drier. All of these procedures may harm and spoil the texture of your fur pieces sometimes even irrevocably. 92. Do not try to remove the oily stains with acetone or petroleum. This will also harm the texture and the looks of your pieces essentially. 93. Do not keep the dyed and not dyed fur pieces together in one place. You might not like the results in this case, either. 94. Do not try to iron the fur pieces with hot iron from either side. The least temperature influence may harm the texture and the structure of the fur pieces. 95. Faux fur items usually tend to turn yellow. To bring back their original color, you can clean them with a solution of citric acid or lemon juice diluted with water. 96. When trying to transport fur pieces over distance, be sure you provide good ventilation for your fur pieces, since they need to breathe and be fresh all the time in order to look good and to serve long. Linen is the following type of fabric we would like to speak about, noting the peculiarities and the characteristic features that the care for linen pieces requires. So this time the list looks like the following! 97. One great thing about linen pieces is that they are just ideal for summer keeping you cool and comfortable also being suitable for sensitive skin types and having hypo-allergic nature. That’s why linen can be considered an irreplaceable fabric for the pieces meant for occasions like evening looks, everyday combos and much more. 98. As for washing linen pieces, we may note that the basic problem that you might happen to face with other pieces being the danger of having misshaped and deformed clothes after the washing cycle does not persist in case of linen options, since the pieces made of this material are comparably steadier and stronger allowing you to wash them both manually and using the washing machine. For brightly colored linen pieces the optimal temperature of washing is 30-40¬¨¬®‚Äö√†√ª, while for white alternatives it’s rather up to 60¬¨¬®‚Äö√†√ª. In order to preserve the shape of the garments you shouldn’t squeeze them right after washing. In addition, you shouldn’t leave these pieces in hot water for a long time since this may weaken the texture and fibers of the products. 99. Drying these pieces in the open air is probably the next important thing. When starting to dry linen pieces you may start out with the natural variants of drying, with the help of which the pieces will acquire a nice feel of freshness. 100. As for ironing you may iron linen pieces with slightly moistened piece of cloth with the pieces turned inside out. 101. Coming to storing linen pieces we may recommend keeping the unique and exclusive tops with gently folded style away from sunlight. So pick the correct places and the principles of storing them, wrapping some pieces into special packets and boxes. 102. Using brand-new suede clothing, you first of all need to remove any dust from the products using a vacuum cleaner. 103. Clean your suede pieces with a rough rubberized fabric from time to time, paying more attention to such areas, as collars, pockets or sleeves. 104. Make sure to dry wet suede pieces outdoors or indoors, avoiding nay kind of heaters. 105. You need to iron suede clothing inside out, making sure you use some kind of thin cloth. At the end of the ironing, clean the suede piece brushing it. 106. To remove any stains from your suede pieces, sprinkle some tooth powder over it and rub it with a brush. Never use gasoline to remove any stains from your suede pieces. 107. To protect your suede coats, make sure to apply a special spray meant for suede, which will especially protect your coat from rain and moisture. 108. Wash your suede clothing in warm soapy water. Never rub or twist it. After washing and rinsing it properly, wipe it with a solution of glycerol (0.5 teaspoon for 1 liter water). Otherwise suede tends to get coarse. After that, roll it up and leave it rest for some 2-3 hours. Next, simply hang it on a hanger and let it dry naturally. 109. You can rinse suede clothing in water with vinegar (3 tablespoons for 1 liter of water), which will make your suede clothing become softer. 110. To get rid of any creases on your suede clothing, turn to steaming. Don’t forget to brush the item afterwards. 111. Faux suede pieces tend to lose their velvety look quite quickly, getting dirty and looking untidy. You can wash faux suede clothing in warm water, using detergent meant for wool and synthetic pieces. 112. Never wash faux suede pieces with patterns on. Instead, clean it with a piece of cloth and special foam meant for wool products. Next, rinse it with a cloth and slightly squeeze it. Make sure to get rid of any detergent residue. Blot it with a dry cloth and hang it over a hanger for the final drying. 113. You can certainly care for your suede pieces at home, however, it’s recommended taking your suede pieces to specialized dry-cleaners once a year, to make sure they preserve their fresh looks. 114. To remove any dirt from the edges, collars and sleeves of your suede piece, remove the crust from a piece of bread, let it get stale and then gently rub the suede pieces with it. You can also use an eraser to de-scuff suede. 115. First of all you need to remember that lingerie pieces made of materials like silk, satin, and lace require hand washing like any other piece of that texture, since in case of hand washing, there might be some irreversible damages for the subtle and beautiful pieces like those. 116. Sink the pieces into a sink with cold water adding a couple of mild detergent. Right before rinsing each of the pieces one by one, you should swirl them around a couple of times in order to make sure that the detergent has penetrated into the texture well enough. Leaving the detergent on the pieces is not at all recommended, since the existence of those details will weaken the pieces and damage the delicate fibers. 117. Never mix pieces with lighter and darker tones together since mixing the colors and especially coloring the lighter toned pieces will be really hard to avoid. 118. In addition, you should also pay attention to the period, during which you wear a certain type of underwear. For instance, you should replace your everyday bras every six months, after which they generally lose their natural shape and elasticity. Also be sure not to wear the same bra for more than two days, since after that the pieces need some time to regain their shape and looks. 119. Every time you take off your swimwear you do need to wash it and despite the fact that it may not require products like detergent for each time, you still have to use some cool tap water in order to clean the sunscreen, dirt, sweat, and the chlorine that may also be stuck to the surface of the swimwear. 120. Only after a few wears can you add a tablespoon or even less of detergent, more preferably of a liquid type to the sink filled with water, swish all for a few minutes and then just rinse well. 121. The principle of being gentle when trying to remove the water after washing works here, too, and you should bear in mind that squeezing roughly, wringing and twisting are all don’ts for swimwear. 122. Some people think that if it’s called swimwear, then letting it dry completely under the sun is the best thing they can do for the good looks and quick drying of the pieces. However, this is actually a bad idea, since this way they risk having faded colors and broken and weakened fibers in the best of the cases. 123. The only case when we do recommend using the washing machine for swimwear is when you plan to keep the swimwear for the coming summer. In this case you may wash your swimwear in special lingerie bags being sure to choose the gentle cycle. Of course, you should do this after several times of wearing the pieces. 124. Try to avoid tossing your sweaty workout clothes into your hamper right away, instead hanging them somewhere if you can’t wash them at the moment. In any case this way you will avoid getting deformations and recoloring of the pieces as opposed to storing the pieces tossed up into limited space. 125. In order to get rid of the unpleasant smell of the sweat after workout, especially for pieces like sports bras, you may just soak them in a sink filled with water and vinegar with the proportion four to one. 126. If you want to wash your technical workout pieces with the washing machine, you may do that in cold water with some additional detergent. 127. As for drying, the lowest setting for heat is recommended and really comfortable here. 128. For down coats we would recommend using front-loading washers, since the top-loading options may damage the pieces. 129. The recommended wash cycle for down coats and vests is the permanent press cycle, combined with the necessary amount of soap or other washing products you may be using. 130. You should not overdose with the proportions of the washing products especially detergents, because they may leave residue on the pieces and make them harsher. 131. Soaking the pieces before or during washing is another good idea to clean up the really dirty pieces. 132. You can also go for double rinsing with an additional wash cycle without soap in order to be sure that there is no residue left on the pieces after the first wash and rinsing. 133. As for drying, you should bear in mind that such pieces dry for quite a while and you may go for drying them with heat treatments, since despite the fact that these treatments do help you to dry the pieces quicker, they may also cause some damages if not selected with proper regime and heat. 134. To remove stubborn red wine stains from any type of clothing, you can always use a white wine. 135. To get rid of unpleasant odors from vintage clothing, spritz them with a mixture of one part of vodka, and two parts of water. 136. It’s not recommended wearing just ironed pieces immediately, as this way you’ll cause new wrinkles and creases. Sticking to our comprehensive and great range of know-hows and tips, you will certainly know how to care for each clothing piece in your wardrobe properly, enjoying their fresh looks for quite a long time.